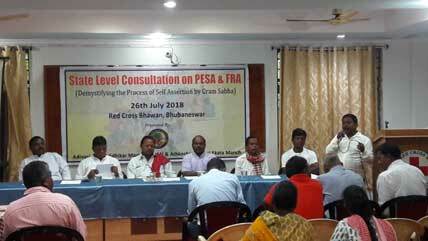 Reported by Bhaskar Pradhan, Bhubaneswar: A state-level consultation on PESA & FRA was organized by Adivasi Janjati Adhikar Manch (AJAM) & Athakoshia Adivasi Ekata Manch on 26th July 2018 at Red Cross Bhawan, Bhubaneswar. More than 65 Tribal leaders from Sundergarh, Malkangiri, Koraput, Rayagada, Sambalpur, Bargarh, and Nuapada joined this meeting and shared their experience and views pertaining to the self-assertion of Gram Sabha under PESA & FRA. Attending the workshop MLA, Biramitrapur Constituency, Shri George Tirkey said; we strongly believe in the Constitution of India and the ongoing process of the assertion by Gram Sabha under PESA is a constitutional process that we have been adhering to. The constitution gives us the right to get united and share our voice. Hence, this is very timely for all the tribal communities in 13 scheduled districts of Odisha to get united and assert their rights that have been bestowed through PESA. While addressing to the Participants of the programme, MLA, Talsara Constituency, Dr Prafulla Majhi said; “Empowerment of Gram Sabha is the key to the development of the tribal communities. PESA provides enormous opportunity for this. Decentralization of power through providing authority to Gram Sabha under PESA can bring change in the existing power relations. Restructuring the present system of Gram Sabha is the need of the hour. And we urge to the Governor to appoint a commission for the restructuring of Gram Sabha. Joining this discussion Shri Kedar Mundari, Member of Athakoshia Adivasi Ekata Manch said “The effort of declaring PESA village is a constitutional process as the Constitution of India gives the right to the tribal communities to have their own self-governance through Gram Sabha in the scheduled areas. In this process of self assertion, we as part of the Gram Sabha have been erecting stone slabs inscribed with Article 244 (1) of the Indian Constitution, Section 4 (B), 4 (E) I of PESA- Panchayats (Extension to Scheduled Areas) Act, 1996 & Section 3 (C) & (H) of Forest Rights Act, 2006 declaring the Gram Sabha to be supreme the supreme authority. While sharing the experience, Shri Bilua Naik, the traditional leader of the Paudi Bhuyan said; “While Gram Sabha is exercising the constitutional rights of self-governance; we have been coming across the adverse image in the media. The major challenge that the tribal communities are facing is how to change this image. 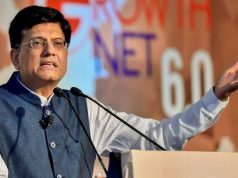 He added, instead of accepting the provisions of PESA the external agencies are disregarding the authority of Gram Sabha that has been bestowed by our Indian Constitution. Shri Nayak urged that the Government need to consider Gram Sabha as a partner in implementing various schemes & programmes. The Government as part of its responsibility should come forward to build the capacity of the tribal communities on constitutional rights and provisions that have been included in the progressive legislation like FRA enacted by the Government for the undoing of the historical injustice on Tribals. The Gram Sabha has been taking many steps like conservation of traditional agricultural practices and local ecology that has the enormous potentiality to meet the challenge of climate change”. A member of Athkoshia Ekta Manch Shri Suprian Xaxa said; “while undertaking the process of declaring PESA village, the Gram Sabha invites the authorities of the district administration and installs the stone slabs written with the provisions of PESA & FRA. In many villages of Sundergarh district, the Government authorities like Sub Collector, Forester, Police, Revenue Officials and PRI members and MLA have joined & witnessed the process of declaring PESA village on invitation by Gram Sabha. 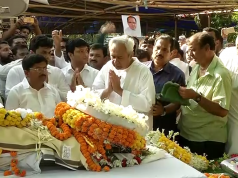 The proceedings of the day along with the photographs are sent by Gram Sabha to President of India, Governor of Odisha & District Administration & Chief Secretary, PR Dept. 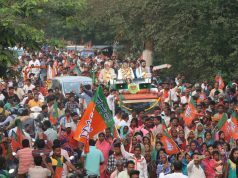 As part of the process of self-assertion, the Gram Sabha shares the proceedings including the photographs of the programme with President of India, Governor of Odisha, and Authorities of State & District Administration”.